For other uses, see Third rail (disambiguation). 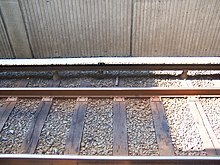 This third rail, used to power trains, would likely result in the death by electrocution of anyone who comes into direct contact with it. The third rail of a nation's politics is a metaphor for any issue so controversial that it is "charged" and "untouchable" to the extent that any politician or public official who dares to broach the subject will invariably suffer politically. The metaphor comes from the high-voltage third rail in some electric railway systems. Touching a third rail can result in electrocution, so usage of the metaphor in political situations relates to the risk of "political suicide" that a person would face by associating with a certain cause, topic, or subject having a highly controversial or offensive nature. It is most commonly used in North America. Though commonly attributed to Tip O'Neill, Speaker of the United States House of Representatives during the Reagan presidency, it seems to have been coined by O'Neill aide Kirk O'Donnell in 1982 in reference to Social Security. ^ Rick Shenkman. "When Did Social Security Become the Third Rail of American Politics?". George Mason University. Retrieved 21 October 2014. ^ William Safire (8 February 2007). "On Language: Third Rail". The New York Times. Retrieved 21 October 2014. ^ Wolfsthal, Jon B. (December 2004). "The Nuclear Third Rail: Can Fuel Cycle Capabilities Be Limited?". Arms Control Today. 34 (10): 11. ^ ""Why is Social Security Called the Third Rail of American Politics?" by Senior Living". About.com. ^ Still a House Divided: Race and Politics in Obama's America, Desmond S. King, Rogers M. Smith, Reprint edition December 8, 2013, Princeton University Press, books.google.com: "Sociologist John David Skrentny exaggerates only slightly when he says that at this point, advocacy of racial preferences was a 'third rail' in American politics: 'touch it and you die.'" ^ Koehler, Robert (4 July 2014). "Going Deep: Race and the Third Rail". ^ Daring to Touch the Third Rail, Robert Koehler, Newsweek, 01/19/08, "Obama has avoided being pigeonholed as the "black candidate" and has mostly steered clear of talking about race on the campaign trail (at least until his recent fracas with Hillary Clinton over whether she besmirched King's legacy by noting President Lyndon Johnson's role in the Civil Rights Act). But Michelle hasn't backed away from discussing her experiences of race and prejudice." ^ Short-Circuiting the New Third Rail in Politics, July 20, 2012, Suzanne Fields, RealClearPolitics, "Race has become the third rail of American politics. Touch it, and you die. It's the rail some of our angriest Democrats want to ride Mitt Romney and the Republicans out of town on." ^ Mankiw, N. Gregory; Swagel, Phillip L. (1 July 2005). "Antidumping: The Third Rail of Trade Policy" – via www.foreignaffairs.com. ^ Christine M. Flowers (24 August 2012). "Searching for light and truth in the Todd Akin controversy". The Philadelphia Inquirer. Retrieved 2012-08-27. ^ Peña, Alejandro Milcíades. "Argentina's president makes the ultimate diplomatic mistake – talking about the Falkland Islands". ^ J. Leech, J. McNish, The Third Rail, McClelland & Stewart, 2013. ^ "Should agricultural income be taxed?". 25 September 2017 – via The Economic Times. ^ "A majority support liberalising policy towards cannabis". YouGov. 30 May 2018. Retrieved 5 October 2018. Drug policy has often been considered a "third rail" issue in British politics. ^ "Political uncertainty must not mean backsliding on social care reform". nlgn.org.uk. 9 June 2017. Retrieved 5 October 2018. The assumption could well emerge that social care has proved to be a "third rail" in politics killing anyone who touches it. ^ "Why the Crimea is the Third Rail of International Politics - Duck of Minerva". duckofminerva.com. This page was last edited on 27 January 2019, at 01:44 (UTC).